Welcome to Dice Men HQ! You can subscribe to the podcast feed here. Find us on iTunes or search whatever podcast app you use. You can listen to the unedited version of the latest shows (including the music, which is actually pretty good (except when Mark is in charge)) from Edge Radio’s website. You can stream Edge Radio live here. And of course you can find all our podcasts here. NEW – Support us via Patreon!! Dice Men Mark, Leon, Garth and Trent… getting along. 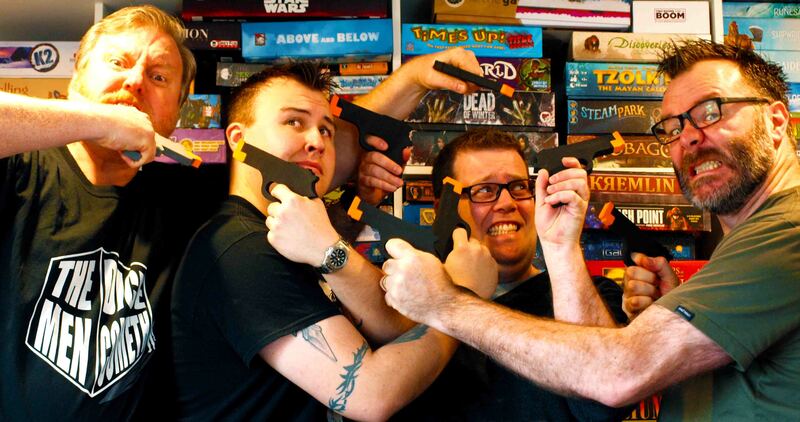 What the hell is tabletop gaming? Just about any game you can play on a tabletop – it’s that simple! Modern board and card games have come a looong way since Monopoly or Gin Rummy. Then there is a slew of role playing games including Dungeons & Dragons, but hundreds more. As you play, you might find yourself running a busy company, competing with wizards, or settling a new planet. It’s always fun but sometimes it’s deadly serious! It’s not just for kids and it’s definitely not just for men! ICV2 – the industry behind the games we love.